Maybe even more American than apple pie (if seniority counts), the sweet potato has been cultivated, cooked and adored in this country since the early 17th century (although its origins go back more than 5,000 years to Central America). A staple in the gardens of both Native Americans and colonists, it was a major source of comfort and sustenance during the winter months. But it didn’t achieve its true American-idol status until West African slaves living in the South adapted their recipes for yams (real yams, which are tubers native to Africa) to the sweet potato. This culinary contribution secured the sweet potato’s place in our kitchens and our hearts. Here, three sweet potato recipes sure to secure a regular place on your dinner table. So dig in! 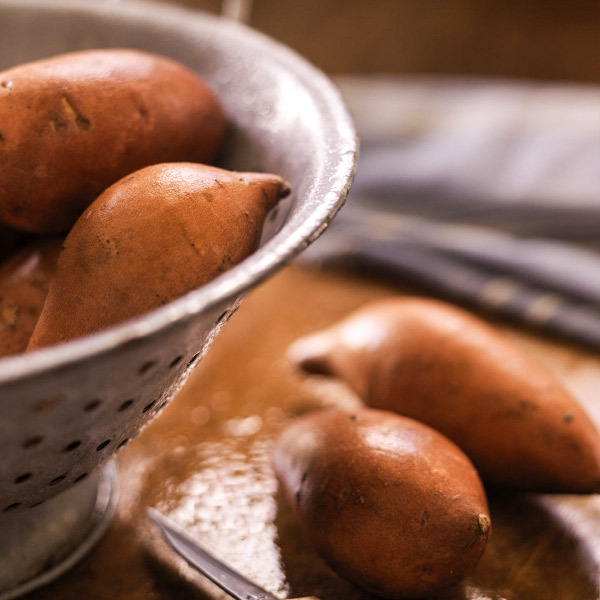 Not only are sweet potatoes great-tasting, they’re really, really good for you, too. Try these new twists (no marshmallows!) on a fall favorite: Sweet Potato Custards, Sweet Potato Chicken Curry and Twice-Baked Sweet Potatoes with Ham & Cheese. Flavored with maple syrup, orange zest and pumpkin pie spice and topped with whipped cream, this sweet potato custard recipe is sure to become one of your new favorite fall desserts. Packed with protein, this hearty main dish combines sweet potatoes, chicken thighs, canned tomatoes, coconut milk and mango chutney with a blend of traditional Indian spices. Sweet potatoes are twice as nice when stuffed with diced ham, shredded Manchego and grated Parmesan cheese! Sweet potatoes are one of nature’s more-perfect foods: low in fat, relatively low in calories, and high in fiber, vitamin B, vitamin C and vitamin E (a vitamin rarely found in such a low-fat food). One 8 ounce, orange-fleshed sweet potato has almost 200 percent of the beta-carotene (and vitamin A) you need in a day. These starchy, sweet roots can be grouped into two main types: the widely available moist- and orange-fleshed (often called yams, even though they are not), and the less-common, drier, yellow-fleshed kind. Depending on the variety, the color of the skin can range from white to yellow, red or purple. Sweet potatoes must be harvested before any heavy frosts occur in the late fall (one reason for their traditional presence at Thanksgiving). However, thanks to climate-controlled storage, they are available year-round.